Email Marketing Setup and Tutorials: To get you up and running an email marketing campaign of your own. 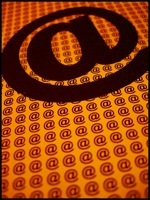 Email Marketing Consultation: To help you generate ideas and content that keeps your audience engaged. Email Marketing Distribution: Managing your mailing lists and monitoring the effectiveness of your email marketing campaigns. It builds your reputation as an information resource to your core audience, and it lets your audience know that you know what you’re talking about. It keeps you connected with your audience, and it gives you the opportunity to stay relevant and provide useful information that your audience will appreciate. If you sell things, or at one point will want to promote something, it’s a great way to have a “pre-sold” audience who trusts you and your opinions. It helps you build traffic and enhance your brand, while engaging in activities that help your bottom line. Contact Us and let us help you get your first campaign started.